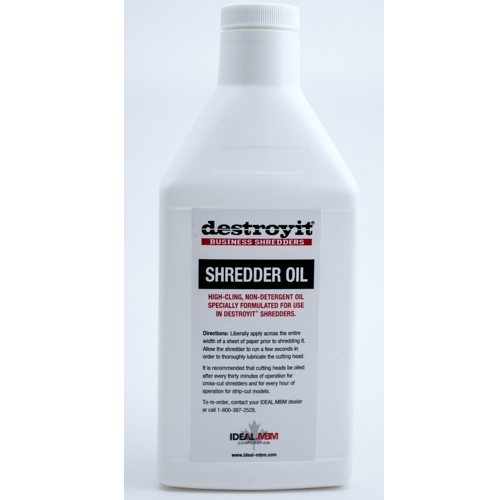 Destroyit Ideal-MBM shredder oil is a specially blended, high cling, non-detergent oil formulated for use in Destroyit® shredders. It is recommended that shredding cylinders / wheels be oiled for every 30 minutes of operation for cross-cut shredders and for every hour of operation for strip-cut models. The most important part of paper shredder maintenance - is to oil regularly. Most high end commercial cross cut shredder models these days come with an automatic oiler build in. When considering a new shredder, choose one of these models with the built in oiling system to save time. The feature will handle the maintenance for you! You just fill the reservoir once the oil level is low and the indicator light comes on.